I arrived to find Evelyn sitting in her chair, waiting patiently for my arrival. She had photos and books lined up on top of her piano to show me. It was incredible that Evelyn was 103. She looked amazing, was very jovial, spoke eloquently, and enjoyed laughing. Evelyn's doctor recently told her, "You have got to slow down - you are doing everything too fast for your age." She answered, "Doctor, have you ever heard of an aircraft when it is zooming around? It has to keep up its forward momentum, otherwise it will drop. Well, that's me! If I don't keep up my forward momentum, I will drop." Evelyn sipped her cup of tea and said, "All my memories - they still flood back." Evelyn Bovett joined the Women's Auxiliary Air Force during World War II. I can just imagine my father putting my mother in a horse-drawn wagon to go over the Crown Range Road. It was a notorious road from Queenstown to Arrowtown to the private maternity home. That is where I was born. Then of course I went back to the farm and did all my schooling there. That was Mount Barker. The hill itself belonged to my father. All of my sisters and two brothers would help our father with the mustering of the sheep on our mountain. It wasn't a terrifically high mountain - it would take about an hour to get to the top. We would do other manual things but we weren't allowed to sow the crops or anything like that. Our father and brothers did that; we girls didn't do that. We did a lot of other things with horses. Then we bought a tractor so we had to learn to drive that. Well, it wasn't hard because we had been driving cars and trucks on the farm, so that was quite easy. You have to remember that in those days, where we were, you wouldn't see a doctor or dentist for ages. If your teeth started to rot, you would just hope that they would wait until the dentist was able to get back up from Alexandra. Those were terrible days when you think back. You just had to put up with things, that's all. My father, William Andrew Bovett, had plans of becoming a doctor. He was very young when his father died and he took over and did lots of things for people in the district. He would splint legs, knowing a lot from his studies about medical things. Father had the medical books and everything ready to go to Dunedin to become a doctor, but it didn't happen. My mother's name was Adelina "Ada" Sophia (nee Brooks) and she came from a family of lawyers. Her second cousin was Kennedy, who was the Supreme Court Judge of New Zealand. I used to go and visit him with my parents when it came to holidays. Kennedy and his wife and sister had a holiday home in Queenstown. There were a whole nine of us, and I was the eldest. There was me, John, May, Aubrey, Sylvie, Robin, David, Ray and Margaret. It was a big thing being the eldest. Margaret and I are the only ones left. She lives in Christchurch. My mother and father put me in their black Model T car. A few people had cars in those days, but more people had horses and buggies. 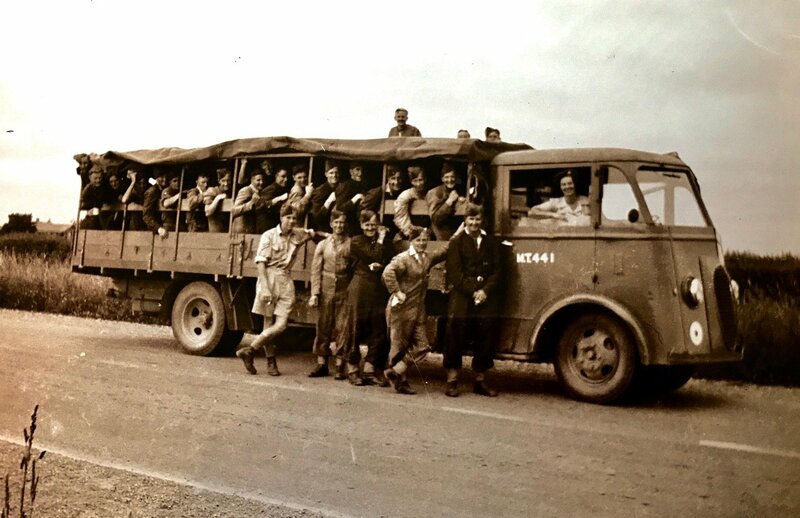 Anyway, I remember going with them from the farm to Wanaka to celebrate the end of World War I. The horses, buggies and a few cars were encircling the people singing and dancing. My mother was crying and I looked at her and wondered why. It turns out that her only brother had been killed in Gallipoli. It meant sadness for her and others that had lost people that were not coming back. I went to Pembroke School and really enjoyed it, especially when it came to the sports field. I joined the Wanaka Golf Club when I was sixteen. 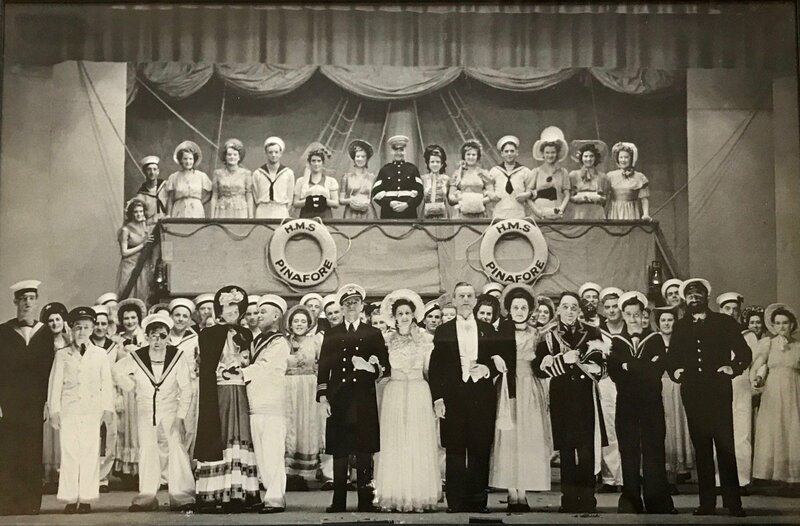 HMS Pinafore, Christchurch Armed Forces Operatic Society, 1944. To get to school we had to cross the Cardrona River which flowed right down to Albert Town. Our father would drive us to the edge of the water and he would throw stones in to gauge the depth of the water. Then he would get in the car and away we would go! We would lift our school bags up off the floor because the water would come right through the car. Sometimes we didn't get very far, we just stopped. The water was coming in the back door and going out the other. Then our father would have to piggyback us to the shoreline. We couldn't get to school on days like that, because we couldn't get over the river. Those were the days; oh my goodness - they were terrible! They have named one of the newer streets in Wanaka after my father. It is called Bovett Place. My mother got ten and sixpence a night for playing at the movies. I would help her by turning the pages. She read sight music and didn't play by ear, like I did or my father did. I remember her saying to me to take over while she went to the ladies' cloakroom. She left and I thought, "What on earth do I play?" Because I had never done it before, you see. So the first thing that came into my mind was Beethoven's "Minuet in G" that I had been learning at music. So I sat down and started playing that, but when I looked at the movie screen it was a Wild West thing on. It wasn't very suitable music for the film. I got away with it. I don't think the audience would have noticed anyway. That was my introduction to entertaining. I moved to Dunedin in 1936 to study light opera. I was a soprano. I had two or three years at that and I enjoyed it. It was my father's idea to study opera. They paid for my training. I don't cost much to keep in food. So take me while she's in the mood. We'll raise a lovely little brood. And I'll show you where I'm tattooed. My aunt was horrified that I would sing these rude words. But that is what they wanted. I used to sing it way up high. My favourite songs to sing would be The Song that Reached My Heart, There's No Place Like Home and Pedro the Fisherman. The first time I sang to a large audience was in Dunedin at the ZB studio. I had to remember when I took a high note to turn my head away from the microphone, because my voice was so loud. The song was Chiribiribin and it had so many verses, I often wonder how I remembered all the words. I also sang in a dance band with 4YA. It was a bit nerve-wracking. The plays weren't as bad; I was always a lead singer in the plays, a soloist. I made my first recording privately in Dunedin in 1936 on an aluminium disc. I still have my first recording I ever did. I performed war songs mainly in the big theatres and town halls. Every Saturday night I'd sing at Joe Brown's dances at the Dunedin Town Hall. Whenever the hospital ship Maunganui came to Dunedin there was an influx of nurses and crew, and Hazel Connor and I always opened the dance with our signature song All Ashore. Hazel specialised in Betty Boop songs and I sang Gracie Fields numbers. The audience loved it. We were paid, but not officially, two guineas (two pounds, two shillings). It was big money compared to Air Force pay, so we kept it quiet. W.A.L Evelyn Bovett 2767, RNZAF Transport Driver, Harewood, Christchurch, 1943. I performed everywhere, all over the place. I used to go up to Timaru, to the Sound Shell. That was one of my bigger moments when I sang there on New Year's Eve. People were lined up on the streets and everywhere I could see and hear my voice reverberating all around the place. I always remember that. I had a very big voice. I didn't need a sound system. I remember singing at the Paparua Men's Prison and being in this great big hall full of men. I remember meeting Gracie Fields in 1945 when she came to New Zealand. I got her autograph! She was beautiful, but seemed a bit nervous when we met her. Grand opera normally leaves me a bit cold. It's not me. I like the light opera. When I was a teenager in Dunedin the boys from the YMCA used to come up and take us to the Saturday night pictures. Different ones would book us. There was a waiting room at the YWCA and sometimes you couldn't remember which one you had booked to go with. The dances were lots of fun too. Oh! And then there were Larnach Castle dances. They were marvellous. We would go up in a bus, or the boy had to have a car. Sometimes if you looked away from the crowds you would see people standing around the open fires cooking potatoes. That was quite a novelty. The Brown Owl was great, but the best place in town was the Savoy Restaurant in Princes Street. That was run by the Barling family and was just a beautiful place. I remember the waitresses wore brown outfits with little white lace caps on their heads. It was just out of this world. The owners had been overseas a lot and brought back gorgeous things that they put in the restaurant. They always had a five-piece band and they would wear cream with black bow ties. The pianist was often Rita Holmes; she was one of Dunedin's greater pianists. Those were the days. In April 1941 I joined the Women's Auxiliary Air Force (WAAF) and served for four and a half years during World War II. I went to the Taieri airfield, near Dunedin. One day, one of the pilots asked me if I wanted to go up for a dive bomb and we went up in a Tiger Moth. You see, in this type of plane the pilot sits behind you and this gave me the willies, because here I was sitting in the very front of this airplane. Nothing happened then. But you know, three weeks later, two Tiger Moths collided and all four were killed. That put me off and I never flew in a little Tiger Moth again. We used the trains to go back home on leave. When we came to our stop the train wouldn't stop. We had to throw our kitbag off and then jump off the train. I just can't believe the things we had to do. However, that was life I suppose. That is what I used to drive, that big long truck with 50 men on board. It was my main job. I used to take the men to the shoreline where the boats would come in and take these boys to Canada for their next lot of training. I often wondered how many of these men would go home. It was quite moving and sad in a way, seeing them sail off. I remember the time that I drove the padre and an officer to a house in Mosgiel to see the wife of an officer who was killed in a flying accident in Taieri. I sat in the car while she was being consoled and wished I could be involved as well. This happened about three times while I was there. It wasn't an easy job. We had to lift up heavy boxes of ammunition from the ground up into the truck. We did all of those jobs. That is what we were there for, of course - to replace the men. One of our jobs was dropping the men off at the rifle range. Once the men had finished shooting at the rifle range, we would collect up the 303s. We didn't wear earmuffs in those days and that's what I blame for having to wear hearing aids now. After the war, I set up my own concert party and toured around with eighteen of us. We were known as the "Melody Stars". These were the pickings from lots and lots of people who entertained during the war years. We performed in and around Christchurch, travelling as far afield as Rakaia and Little River on the West Coast. We performed about 300 concerts in all. My last public performance was in 1985 at Christchurch's Theatre Royal. I was 72. My husband was one of those men that didn't want women joining the Air Force - there was no way that he wanted women coming into his domain! And he ended up falling for me! He was very likeable. Keepers of History is out now but will be launched at the Dunedin Public Library on Saturday, April 6 at 11am. My husband Thomas "Duncan" Hutchings was posted where I was in Harewood, Christchurch. He was overseas and back a lot. He was a Flight Sergeant. While Duncan was in Bougainville after the war, he saw my photograph in the New Zealand Freelance. The article said that I was going to be taking the lead in HMS Pinafore. He thought, "I must write to that woman!" He must have thought he was in contention, but I was doing my own thing. I just played the field. I flirted with them all and didn't marry a soul. I told the men that I was married to my music and my singing. Anyway, Duncan came back from Bougainville and he was only back a short while when he came to visit me. He asked me then if I would marry him. I thought, "Well, I suppose I am getting on in years. It won't hurt me to get married." It wasn't quite like that; there was a wee bit of romance there. We got married and later on Duncan was in Fiji, while I was in New Zealand with our baby. I had to wait until accommodation was ready. I got on this Tasman Empire Airways flying boat, a big four-engine plane that took off on the water. It was an eight-hour flight from Auckland to Suva. We had three children - Janice, Philip and Kay. When I was in labour with Philip in Fiji, the nurse was busy reading the newspaper while I was having contractions. Then she said to me, "Don't have the baby yet, I can't find the doctor!" "Heavens above!" I thought. The doctor was watching a soccer game on TV. Lucky for me the doctor did turn up in time but he brought with him a large audience to watch. The whole experience was a bit of an eye-opener for me. We eventually returned back to New Zealand and lived in Weedons, south of Christchurch. Duncan was in the Air Force for 26 years altogether. That was his life - he just lived for the Air Force. I went back to Fiji for my 90th birthday. It was wonderful and only took three hours to get there in the plane. We even went back to our old house. When we moved to Newlands in 1962 I joined the Church of St Michael and All Angels, an Anglican Church. Sometimes I played the organ. I also trained the children for singing and taught Sunday School. Every Anzac Day I laid the wreath at the Wellington Cenotaph for the Air Force girls. Recently, my family have walked with me to the Cenotaph to make sure I don't trip up. It is a real honour to represent the Air Force women. In 2016 I went up to Ohakea to celebrate women having been in the Air Force for 75 years. I can walk without a walker but I am not supposed to. My knobbly hands have arthritis and have stopped me from playing the piano fluently. But never mind, I have lots of recordings of me playing from over the years. I didn't think much about being 100. It was just another day. I told my girls not to make a fuss and have a small thing with family. But they had organised a big event with over 120 people there. A big stretch limo picked me up from my house and I sat in there with my friends and drank champagne. I couldn't believe it. They came from everywhere for my birthday. On my 100th birthday, they played a recording of me singing. Sadly, Evelyn died on 27 August 2018.